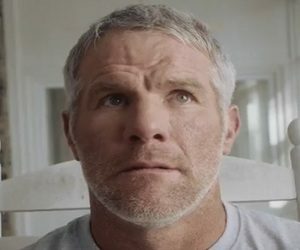 Buffalo Wild Wings has released a new commercial, starring Brett Favre. The spot, created based on the idea that football fans have blamed Buffalo Wild Wings for unexplained events occurred during a big game, features the former NFL quarterback, who has thrown his share of INTs, as he is approached by two mysterious men in black at his farm, where he practices his throws on scarecrows costumed in football gear. The men, justifying they’re there on “official business”, tell Favre they need to talk to him and, arrived inside, they open the suitcase they carry, letting him see a footage of his INTs, and saying that not all of those interceptions were his fault. When trying to reveal what it was, Favre intervenes with his ideas: “Aliens?”, “Witches?”. “We’re actually not here on official business”, reveals on the two men, adding they are Buffalo Wild Wings and changing their faces with Favre’s face after pushing a button on a remote control. “Is this weird or what?”, asks the other man, making Favre scream. The next scene feature Favre waking up (which means this was a nightmare) and putting a new post-it on his “investigation” wall, where dozens of clues are pinned down, such as other post-its (with texts Bartenders Control Game, St. Louis Sprinklers, Magic Remote, Aliens?, Fumble) and multiple photos. The new post-it, much bigger than the others, contains the writing Buffalo Wild Wings. “Gotcha”, says Favre, slapping his hands. The spot ends with the onscreen line “It Wasn’t Us”, which turns into “It Was Us”.